Enantiomeric molecules resemble each other like right and left hands. Both variants normally arise in chemical reactions. But frequently only one of the two forms is effectual in biology and medicine. Hitherto, completely converting this mixture into the desired enantiomer was deemed impossible. Deploying a photochemical method, a team from the Technical University of Munich (TUM) has now achieved this feat. Producing active ingredients with very specific properties – antibacterial characteristics, for example – is not always so easy. The reason: many of these organic compounds are chiral. They have two mirror-image forms, so-called enantiomers. This small difference can be consequential because the two enantiomers can have different properties. While one has a healing effect, the other might be ineffective or even cause unwanted side effects. “For a long time, researchers around the world have been seeking ways to selectively synthesize only the desired enantiomer from a racemate,” explains Prof. Thorsten Bach, holder of the Chair of Organic Chemistry at the Technical University of Munich. However, this has been very difficult, since chemical reactions usually produce both molecule variants. 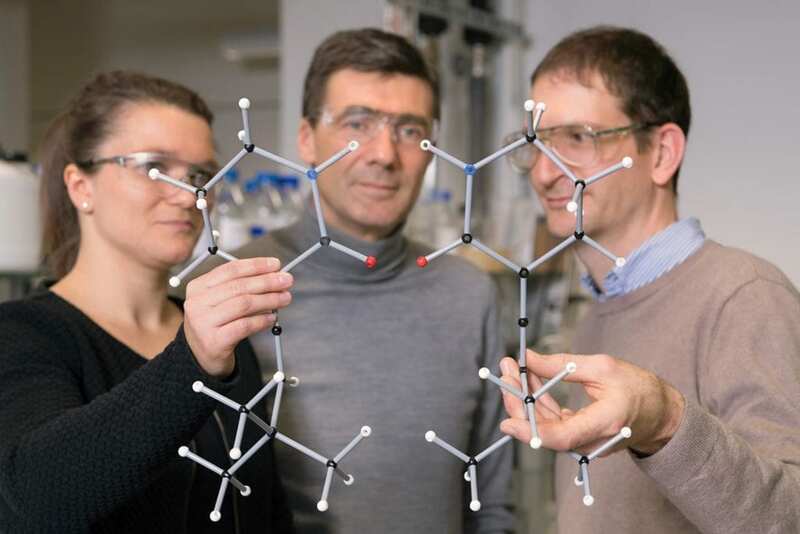 Together with his team, the researcher has now developed a method with which the desired enantiomer can be obtained from a racemate, the mixture of both enantiomers, in high concentrations of up to 97 percent. Rather than painstakingly extracting the unwanted mirror-molecules from the mixture, the researchers use a photochemical reaction to transform them into the desired end product. “That saves time, energy and resources because all the molecules are used and you do not need to throw away half of them,” explains Bach. The secret of the transformation is a special photochemical catalyst. Originally, the thioxanthone sensitizer was developed for [2 + 2] photocycloadditions. The dye is itself chiral and therefore specifically converts only one of the enantiomers to the other. In the span of a few minutes, the equilibrium shifts in favor of the desired molecule. The undesirable mirror images disappear. The chemists have successfully tested their new method on various molecular mixtures from the allene structural class. “We could thus demonstrate that selective and efficient catalysis to prepare enantiopure compounds from racemates is fundamentally possible,” said Bach. The project was funded by the German Research Foundation (DFG) as part of the Research Training Group GRK 1626, a Reinhart Koselleck project and the Cluster of Excellence RESOLV. Cooperation partners were the universities of Bonn and Bochum.